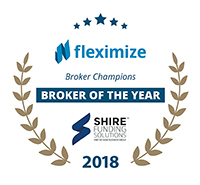 Shire Funding Solutions Limited (“Shire”) is committed to providing the highest quality service and ensuring customer satisfaction. However, should you feel that we have done something wrong, we welcome the opportunity to learn from this and we have a Complaints Procedure in place to assist us in resolving your concerns. We act as both a lender and a credit broker working with a panel of finance lenders to find a suitable arrangement for you. We do not offer any advice to you on the legal or financial implications of entering into credit arrangements or particular finance products and you must carry out your own due diligence and seek your own advice. Shire Funding Solutions is a trading name of Shire Securities Limited. Shire Securities Limited is Authorised and Regulated by the Financial Conduct Authority for certain types of consumer credit lending and credit related activities that are regulated under the Consumer Credit Act 1974 and by the Financial Services and Markets Act 2000. Registered in England Co. No. 05881283. VAT No: 120 9433 41. Registered Office: 1 Calico Business Park, Sandy Way, Tamworth, Staffordshire, B77 4BF. Subject to credit status, terms and conditions apply.